Today we have brought four such smartphones for you, which have recently been launched in India. One of the many features of these smartphones is their low cost. You can buy these smartphones at less than Rs. 10,000. 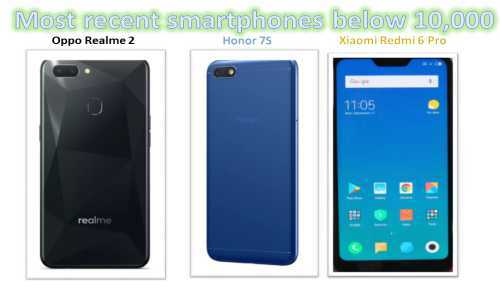 So know the names, features, and price of these smartphones. So you can choose the best smartphone of your choice. Redmi 6 Pro has a 5.84-inch full HD display with the Nokia feature. An aspect ratio of this mobile is given at 19: 9. The phone comes in two variants of 3GB / 32GB and 4GB / 64GB storage. Its processor runs Octart snapdragon at 625. In this, you get 12 megapixels and 5-megapixel dual rear camera. Plus the 5-megapixel front camera is available for a selfie. The phone gets power from 4000mAh battery. Oppo Realme 2 has a 6.2-inch Full HD Plus IPS LCD display. The Mobile screen resolution is 720x1520 pixels and the aspect ratio is 19: 9. The phone gets power from the Qualcomm Snapdragon 450 processor. Its operating system runs on Android Orao 8.1. The phone comes in two variants of 3GB / 32GB and 4GB / 64GB storage. The internal storage of the phone can be increased to 256GB via micro SD card. For photography, it has 13 megapixels and a 2-megapixel dual rear camera. At the same time, the mobile front camera is equipped with an 8-megapixel camera. The phone has 4230mAh battery. Price: Oppo Realme 2's 3GB RAM and 32GB storage variant are priced at 8,990 rupees. The cost of 4GB RAM and 64GB storage mobile variants is 10,990 rupees. Xiaomi Redmi 6A has a 5.45-inch IPS LCD display, which has an Aspect ratio of 18: 9. It has been given the MediaTek Helio P22 processor. On the other hand, talk about its operating system of this mobile it runs on Android 8.1 Oreo. The phone comes in two variants of 2GB / 16GB and 2GB / 32GB storage. You can extend its internal storage by up to 256GB via micro SD card. Xiaomi Redmi 6A has 13 megapixel rear and 5-megapixel front camera. It has a 300mAh battery. Price: 2GB RAM and 16GB storage variant of Xiaomi Redmi 6A is priced at Rs 5,999. At the same time, the price of 2GB RAM and 32GB storage mobile variants is Rs 6,999. Honor 7S has a 5.45 inch full HD view display. Its screen resolution is 720 x 1440 pixels. At the same time, its unsecured ratio is 18: 9. Its processor runs on quad-core mediaTech MT6739. Talk about its operating system then runs on Android 8.1 Oreo. Honor 7S has 2GB of RAM and 16GB of storage and storage can be increased to 256GB via micro SD card. For photography, it has 13 megapixel rear and 5-megapixel front camera. Price: The value of the Honor 7S smartphone is Rs. 6,999.